Well, my imaginary interlocutor, sort of. 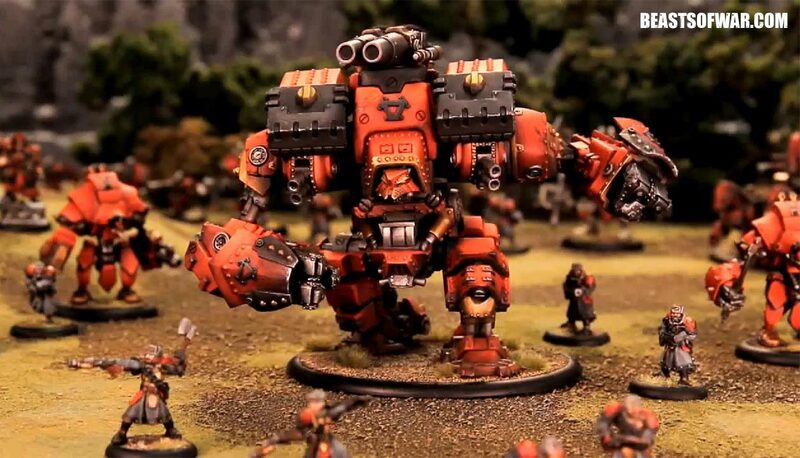 Warmachine is a game about steam powered robots with smokestacks bigger than their legs, where wizards shoot spells out of pistols and your “warcaster” channels their willpower to bend the battlefield to their plans. Hordes, by contrast, is a game about lumbering monsters with fists bigger than their heads, where wizards shoot spells out of staffs and your “warlock” channels their rage to bend the battlefield to their plans. 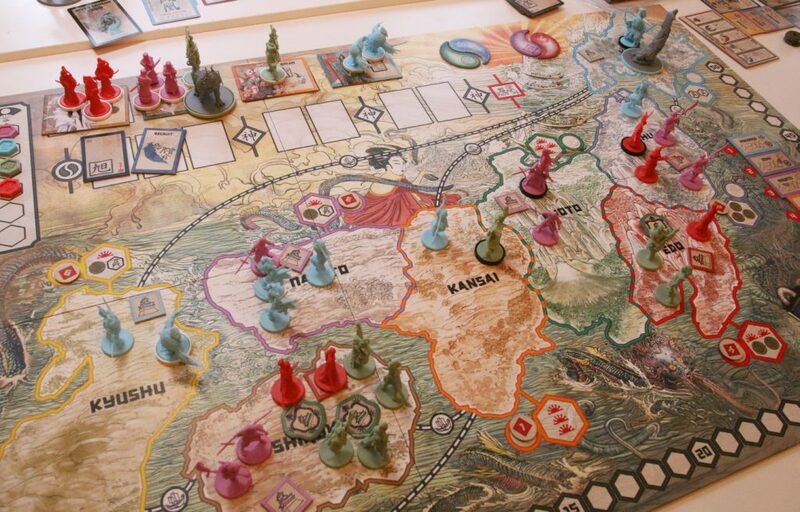 Other than their different resource systems and specific units, they use exactly the same rules and setting and can be played against each other. Indeed, Hordes is often referred to under the umbrella of “Warmachine” (a convention I will continue here), or the grammatically monstrous “Warmahordes” (which I will hopefully never type again). So what makes the game tick? From a mechanical standpoint, there are two things. One is the centrality of you army’s leader, called a warcaster or warlock (depending on the system). They are immensely powerful, with a list of game-bending spells and a downright game-breaking single-use feat. They are also often deadly in melee or ranged combat, and pretty tough to kill. They are your stars, your avatars on the field of battle. And if they die, you lose. This is Warmachine’s love-it-or-hate-it feature. You have this awesomely powerful character, but you also have to spend a huge amount of your time protecting him or her. It’s sort of like combining the king and queen in chess. You want them to run the table, but you also know they are your weak spot. You live in constant fear for them, and you will lose games (a lot of games) because you left them too exposed. 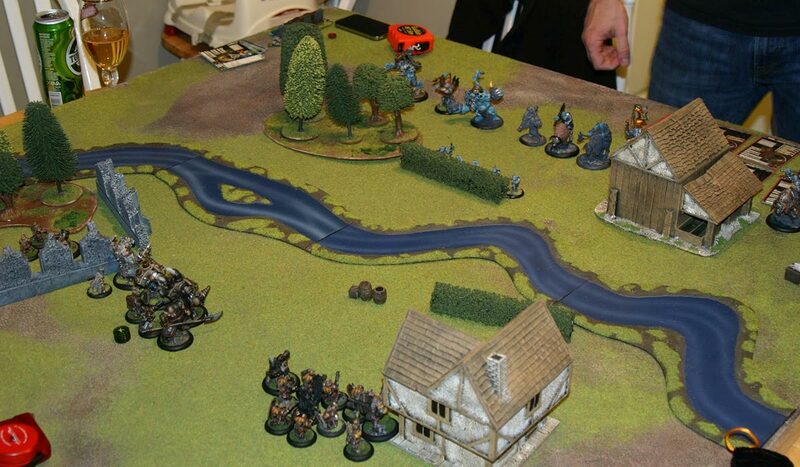 Yet while this can be off-putting, it is also part of what makes Warmachine great. Caster assassinations offer a risk/reward decision point of the highest magnitude. I can’t count how often I’ve paused on my turn, fiddling with my little tokens that represent focus or fury (the resource you spend to do cool stuff, but that when unspent increases your defenses). Can I risk it? Do I dare? There is something both stressful and tantalizing about every one of those choices. What’s more, caster kills also provides an intriguing catch-up mechanic. When you realize you’re losing, the response in Warmachine is not to sigh and resign yourself to a slow, grinding defeat. Instead, you start staring at the board and scheming that crazy last-ditch assassination run that might somehow still win the day. Often these make for the most memorable moments in the whole game. Even better in a way, when they fail, you’ve usually gone chips in and your opponent will mercifully end your agony with ease. Either way, the game has a climactic finale. 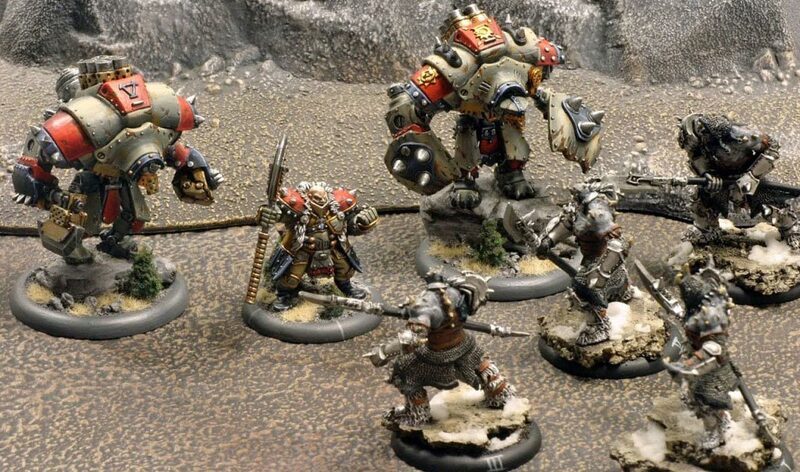 The reason that these last-ditch strategies can work is because Warmachine is also a game where you can use models together to enhance each other exponentially rather than incrementally. You feel like you can do almost anything, if you can just get the right soldiers together in the right place. Warmachine understands the pleasure found in doing complicated things to achieve amazing results. Admittedly, powerful combos aren’t unique to Warmachine. Lot’s of games understand the intoxication of untangling such mechanical knots. But it does two noteworthy things with them. First, it is ridiculously liberal in their application. It is balanced not by restraint but by excess. Everybody has crazy stuff they can do. I can’t think of another game where I’ve heard “Crap, that is so overpowered” said more in a single session. But since everything else can be overpowered too, nobody get’s too angry. 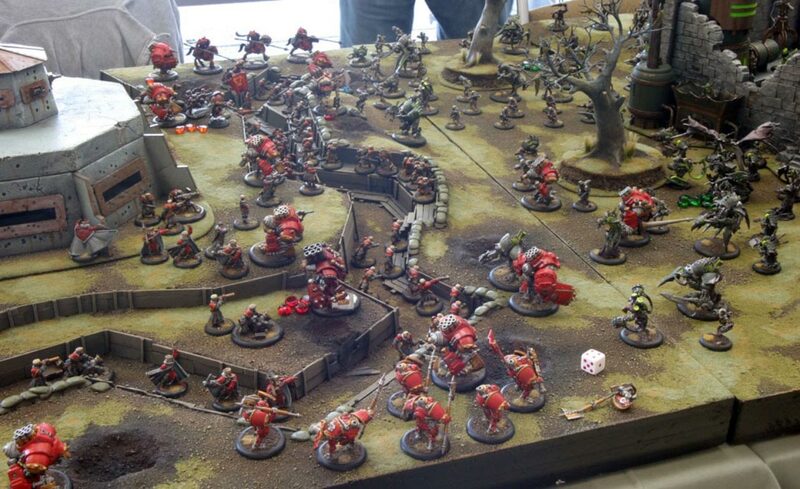 What is even more unique is that, because it is a miniatures game, there is a crucial spatial element that comes into play. Combos are being executed not in a tableau of cards or tiles in front of you but in three dimensions. There is something tangible to them. 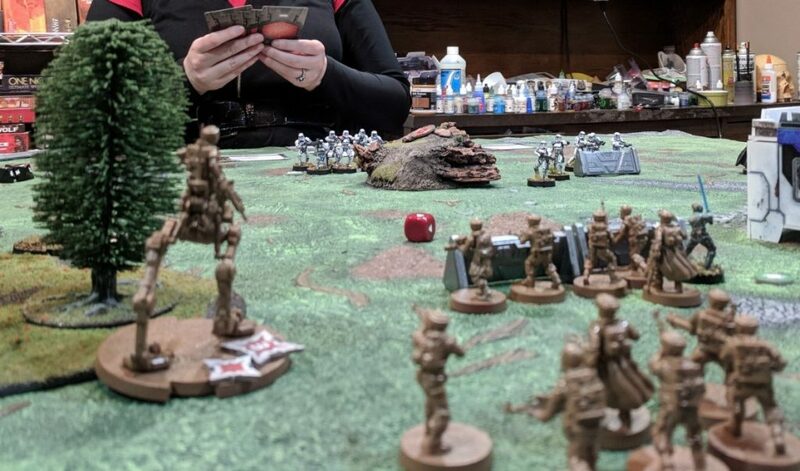 You aren’t just thinking about how your models’ powers interact, but where they have to stand in relation to each other for that interaction to occur, and where your opponent is standing, and where both of you will be on your next turn. This makes triggering these abilities in tandem far harder and more rewarding. While those are the mechanics that make Warmachine special, there are also certain intangibles that set it apart. 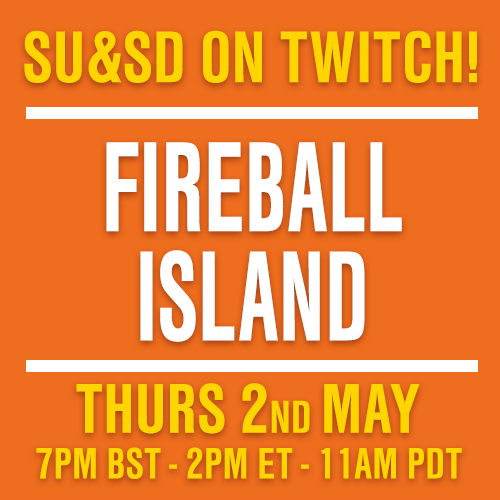 First, it is particularly geared towards competitive play. 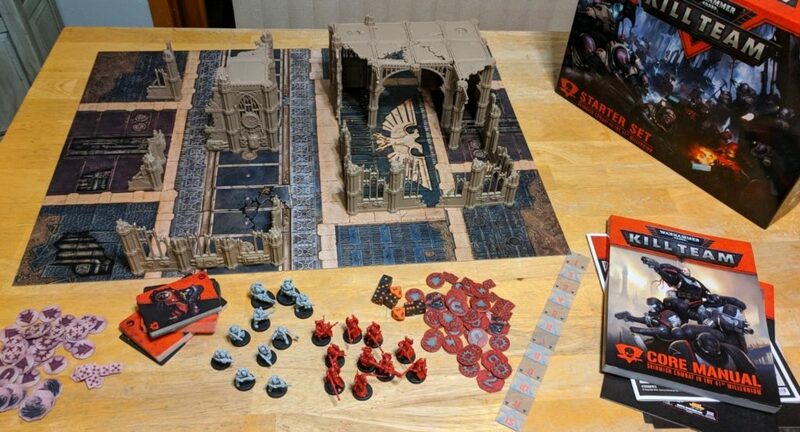 Many tabletop miniatures games focus on the “fluff” and storytelling and try to make the rules prop this up. Privateer Press seems intent on letting the rules stand on their own. This doesn’t mean there isn’t plenty of fluff. Nor does it mean that Warmachine is more balanced than competing games. I don’t think it is, and besides, comparing balance between games is like comparing the physical appearance of peoples’ babies – it doesn’t ever end well, even though yours is obviously the best looking. What I do mean is that Warmachine is very deep in terms of how skill and knowledge can affect the outcomes. I’ve played a few truly great players over the years, the ones who regularly compete in national tournaments (Warmachine also has a particularly active tournament scene, if that is something you enjoy). 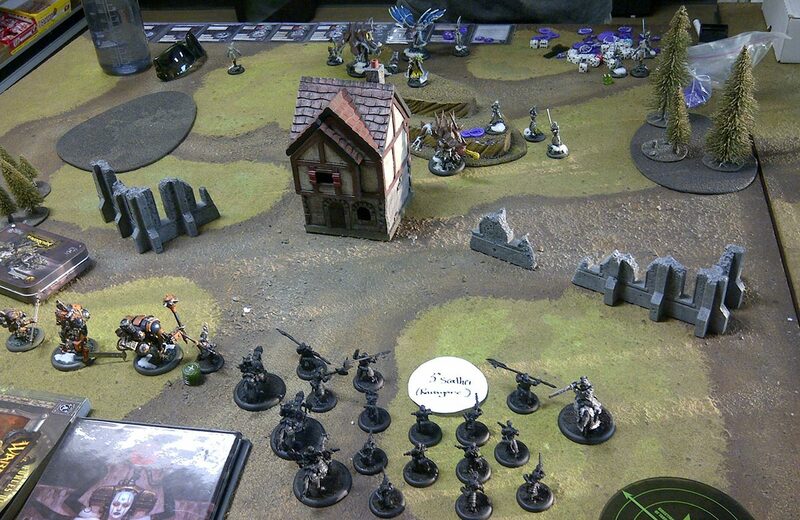 I am no novice to the ways of the warcaster, but the trouncing I received at these players’ hands was humbling. The only other time I’ve lost that badly at a game I knew was the chess matches I played against a homeless guy who used to frequent the coffee shop where I worked. A homeless guy who, I later learned, was a USCF national master. This can be a turnoff to some, and rightly so. I’ll be covering some games in the future that cater more towards light play. But don’t let it scare you off. 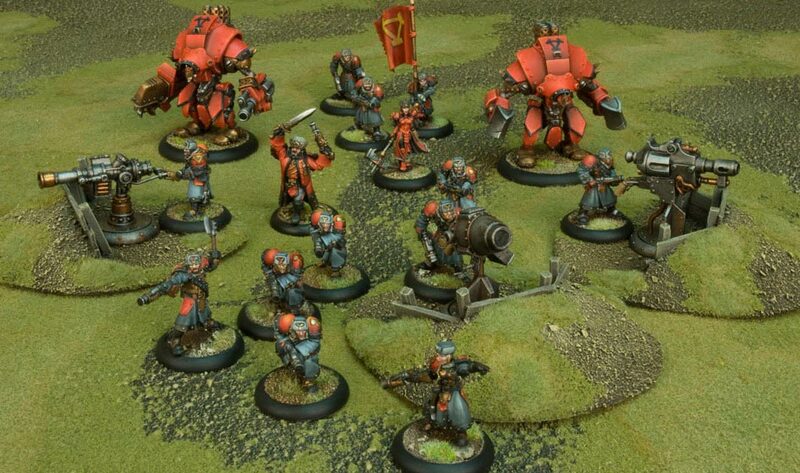 I certainly don’t aspire to that level of competitiveness, but it gives Warmachine this striking depth. When I play, I find myself wondering just how deep the rabbit hole could go. Knowing that players can be that good at the game makes me think differently. I analyze. I try to improve whenever I play. It gives me a feeling of personal progress that transcends just pushing some little painted figures around a board. Lest you think it is all about millimeters and mechanics, however, I should also say that Warmachine is funny. While it strives for a competitive set of rules, it is a rules set where crazy things happen. Indeed, it has a unique capacity to make me laugh out loud. A simple example. I was losing a game (a very common experience), playing the Hordes faction Trollbloods. I knew, if I was going to pull this off, I had to assassinate. I looked at my spells and buffs and devised a plan to do it, but first I had to knock their caster down, making them much easier to hit. And there was nothing nearby. I sat staring at the board, feeling defeated, when I saw it. It was crazy, and if it didn’t work I would lose for certain… but I slowly smiled. So my warlock, who had been safely hanging in the backfield, cast some spells and then went charging forward as far as he could. One of my hulking trolls, out of reach of the enemy caster himself, then walked up and picked up my warlock and threw him into his enemy counterpart. And some dice were rolled, and some damage was done, and there they both were in a tangled and, crucially, knocked down mess in the middle of the table. And then my other big troll ran up, went berserk and… ! And he failed miserably to accomplish anything. So my bleeding and prone commander was summarily executed. But it didn’t matter, because I had done something awesome and hilarious. Those sorts of unexpected and delightful moments are really what wargaming is all about for me. One final note, if all that sounds like your cup of tea. Let’s talk cost! Warmachine, while still cheaper than other large-scale games of the miniatures world, is a fairly expensive game to buy into. Building a 50-point army (the normal competitive size) will easily set you back $200, if not a bit more. However, I’d encourage you to drop by your local shop and ask if there is a “Press Ganger” for the game in your area. These are volunteers in Privateer Press’s remarkably robust community support arm. Besides demoing the game, they can also clue you in to various slow growth leagues which many shops run and which allow you to build up and paint a list over 3-4 months, allowing a much easier entrance to the game.